Renowned economist Jeffrey D. Sachs launched the United Nations Sustainable Development Solutions Network (SDSN) in Berlin this week in cooperation with ICC Germany and the German Development Institute (DIE). UN Sustainable Development Solutions Network presented in Berlin. During the event, entitled “New pathways towards global sustainability”, high-ranking representatives from research, business, politics and civil society discussed initiatives in support of sustainable development around the globe. The Solutions Network, founded under the patronage of UN Secretary-General Ban Ki-moon in August 2012 and headed by Jeffrey Sachs, develops these practical solutions. “In the 20 years since the first Rio Earth Summit, the world has largely failed to address some of the most serious environmental and social problems pressing in on us,” Mr Sachs said. “We can’t afford business as usual. We need to engage the academic and scientific community, and tap into worldwide technological know-how in the private sector and civil society, in order to develop and implement practical solutions.” To exert influence on various processes on the global policy agenda, the network provides expert advice, e.g. to the High-level Panel on the Post-2015 Development Agenda. One of the central questions is how the Millennium Development Goals (MDGs) and the Sustainable Development Goals (SDGs), agreed upon at the Rio+20 Conference in 2012, can be combined. 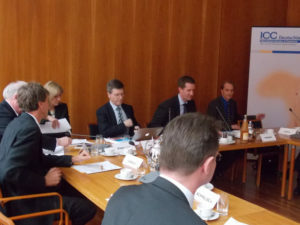 German business leaders and academics already participate in the Solutions Network. Within the framework of the German launch event in Berlin and together with representatives from politics and civil society, they discussed experiences and lessons learnt from the German energy transition. “For decades, German companies have been striving to foster, in a responsible fashion, economic, social and ecological development through innovations. But no one can meet the sustainable development challenges alone. To be truly successful, we need to drive forward an internationally concerted approach, one of ICC’s utmost concerns,” emphasized Mr Gentz. What contribution can the German approach make for sustainable energy solutions in other countries? Do we need a Club of Low Carbon Pioneers playing a leading role in the transition to a low-carbon global economy? These were some of the questions tackled by participants at the event. “The SDSN is not only a timely initiative, but also a great opportunity for the private sector to engage with non-traditional actors and jointly develop new alliances and best practices that will lead to innovative business models for the future,” said Martina Bianchini, Vice-Chair of the ICC Commission on Environment and Energy and Vice-President of EU Government Affairs & Public Policy for Dow.